Come be a part of the team at a new restaurant in Rittenhouse Square. 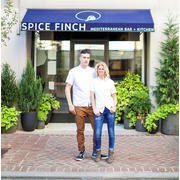 Spice Finch is inspired by the distinctive flavor profiles of the nations bordering the Mediterranean Sea. Chef Jennifer Carroll has created a bold seasonally accurate menu featuring an array of small plates, vegetables, grilled meats and fish. If you'd like to join our team please send your resume along with the position you’d like to apply for. We are looking for sous chefs, kitchen managers, line cooks, dishwashers, bussers, and hosts. We will be looking to fill all positions with individuals who are passionate and committed to creating great food and offering outstanding hospitality. Applicants should have experience in the position for which they wish to apply as well as a desire to learn and grow in a professional and hospitable environment. Named after the bird that populates nearly every port along the ancient maritime spice routes, Spice Finch pays homage to a passerine that does not sing, yet is known to vocalize or chirp in recognition of good eats. We are inspired by the distinctive flavors of the nations bordering the Mediterranean Sea, and heavily influenced by the cultures and culinary traditions of Morocco and Greece.